Last fall, Buddy Nielsen of Senses Fail called me to give me some background for a piece – a piece which I’ve been trying to figure out how to write ever since. A relatively common practice amongst bands with buses on Warped Tour is renting out unused bunks to folks working on the tour. Senses Fail allowed a young band, We Are Forever, to rent some bunks while they spent the summer following the tour and hawking their music to the kids waiting in line each day. (Anyone who has ever been to Warped knows this type well.) That band was ultimately removed from the tour after Buddy became aware of allegations against a member (which came along with now requisite screenshots) of inappropriate conduct with underage girls.2 Buddy spoke to the other members and gave them a choice: either lose him, or lose your spot on my bus. The band chose to support their bandmate and leave the tour, despite knowing what he did. They aren’t the first band to make such a decision for the sake of so-called loyalty. When up-and-comers Better Off torpedoed their own spring tour to protect a hired gun accused of sexual assault earlier this year, the response was one of shock and disappointment throughout the scene. Yet again, the accuser alleged that she made the abuse known to people close to the situation before taking her truth public, doing so only when she met the same resistance and refusal to “take sides” that so often precedes these accusations on a public forum. So what does this mean? Where does this leave us? This brings me to my solution. It’s not an easy one, but it can singlehandedly decimate call-out culture and put writers like me out of a job. It can keep people who may have made a one-time mistake from being lumped in with the serial perpetrators. It can create a climate in which private solutions and reparations are possible while simultaneously creating a world where consequences can be doled out without the humiliation that so often falls on all parties involved. I truly believe this is possible. The solution: when you see something, say something. When you hear something, say something. When you know something, say something. Perhaps the only thing more disheartening than abuse itself is the stark realization that said abuse had witnesses who choose to stay silent until the only option was taking the statement public. This practice ensures that “call-out culture” remains necessary. It means the so-called witch hunts have to continue. So, gentlemen, do you want to know how to destroy call-out culture you claim to hate? Speak up. The enemy of call-out culture is action. It is a direct response to the idea of “No More Silence” – the idea that nothing will change if we don’t speak up. But imagine for a moment a world where it doesn’t have to get to this point. Imagine a world where a group of decent young men just trying to put their music out there in the world hear about someone on their team, or in their band, causing harm to another human being and not writing that harm off because it’s easier. Imagine addressing it and everyone involved doing their best to make it right, to protect others – their own fans – from harm in the future. Imagine refusing to work with people who are harmful to others – imagine prioritizing public safety over your buddy’s feelings. Imagine setting the standard higher and saying, “If you want to work with us, you have to be a decent person.” Imagine that world. You’re imagining a world where women, where people of color, where all gender identities and sexual orientations feel safe. You’re imagining the world punk promised it would be – the world it never has managed to be. Imagine that world. 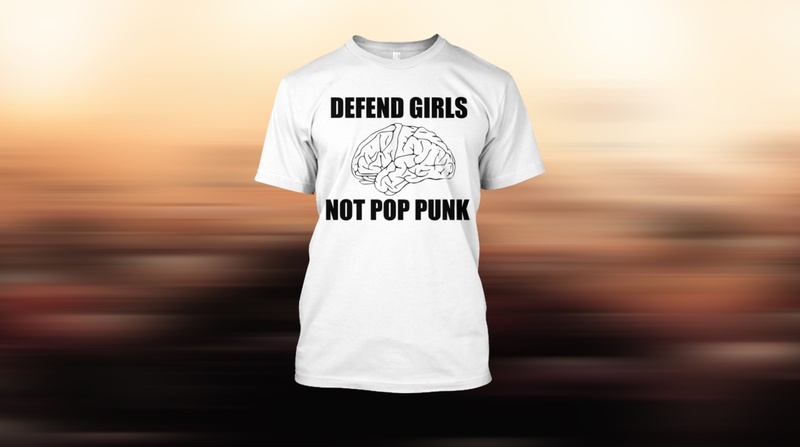 So next time you find yourself down about the way these allegations and scandals are harming our scene, remember that there’s only one way to put a stop to it: defend girls, not pop punk.